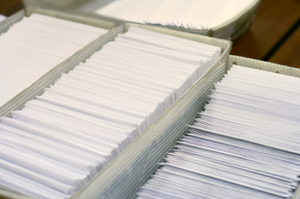 At Printech, we work with the US Postal Service on a daily basis, which means we'll help you secure the best rates possible for your direct mail campaign. Our team knows what it takes to provide mailing services that lead to your ultimate marketing success. Even if your direct marketing campaign has the perfect message, graphics, and copywriting, it will not be effective unless you're targeting the right people. If you improve your list, you'll improve your ROI! About 40% of a direct marketing campaign’s success is based on its mailing list. Your product may be great and you may have extremely creative and attention-grabbing marketing materials, but without a strong list, they won’t get the best returns possible. Contact us today for more information on Direct Mail!